The population decreased by 1,400 due to negative natural increase (the number of deaths exceeded the number of births) and increased by 6,090 due to positive net migration (more persons immigrated to Estonia than emigrated). In total, the population of Estonia increased by nearly 0.4% in 2018. In the case of births, also the number of births per woman can be considered. As there are more women in the second half of their active childbearing age than in the first half, the number of births of first children and its share in the total number of births has declined already for some time. The birth of third and additional children is required for the natural recovery of the population; however, from the third child, the economic setback of families is greater than in the case of the first two children, and, in order to avoid this situation, some children may not be born. In the period of re-independence, fertility in Estonia has been significantly lower than the replacement level. In recent years, however, the state has considerably raised the allowances for families with three and more children to support births. This has contributed to an increase in the number of births of third children – in 2018, compared to 2017, the number of third children born increased by more than 500, which signifies an increase of more than 20%. Third children accounted for a fifth of all children born in 2018. There were 15,670 deaths in 2018. The number of deaths has remained in the range of 15,200–15,800 in recent years. As life expectancy continues to increase, the share of older people increases in the population. 13,030 persons immigrated to Estonia and 6,940 persons emigrated from Estonia in 2018. Migration statistics are most difficult to estimate based on preliminary data, as Statistics Estonia supplements migration figures with data from other registers, and later adds also unregistered migration according to the rules for determining permanent residents (residency index). Reaching the final result is more complicated compared to other events, both technically and methodologically, and can significantly increase migration flows. Emigration increases mainly due to unregistered leaving of Estonian citizens. Immigration increases mainly due to their return migration, which is not recorded in the population register, as the prior leaving was not registered. Compared to immigration, emigration is less registered, and therefore, emigration increases presumably more than immigration in the revised population number – it can be assumed that net migration is somewhat smaller in the results published in May. For the statistical activity “Population”, the main representative of public interest is the Ministry of Social Affairs, commissioned by whom Statistics Estonia collects and analyses the data necessary for conducting the statistical activity. According to Statistics Estonia, in 2017, life expectancy at birth was 73.7 years for males and 82.3 years for females. In the last ten years, male life expectancy has risen by 6 and female life expectancy by 3.5 years. As a result, the difference in male and female life expectancy has decreased. The difference between male and female life expectancy is decreasing: in 1994, the difference was 12 years, ten years ago, it was over 10 years, and by 2017, it was 8.6 years. Compared to the average life expectancy in the European Union, people in Estonia live on average 3 years less, but this difference has diminished over the years. Compared to the European Union average, the female life expectancy in Estonia is 1.4 years shorter and the male life expectancy is 5 years shorter. According to 2016 data, in the European Union, the longest life expectancy for males was in Italy (81.0 years) and for females in Spain (86.3 years). Estonia ranks 23rd in the European Union in terms of male life expectancy; it is shorter in Lithuania and Latvia. As for female life expectancy, Estonia has a higher 19th ranking, ahead of all the former Eastern Bloc countries. Bulgaria and Romania have the lowest female life expectancy indicators. On average, in the European Union, the difference between male and female life expectancy is 5.4 years. The difference is smallest in the Netherlands (3.2 years) and greatest in Lithuania (10.6), Latvia (9.8) and Estonia (8.6). In Europe, such greater differences can only be found in the other former Soviet Union countries. Life expectancy depends on many factors, the most important of these being the environment, accessibility of healthcare services, living standard and health consciousness. The somewhat shorter male life expectancy is not surprising as men are more prone to risk-taking. The greater share of physically demanding jobs or those posing more risk to health is a likely factor. In Estonia, more people on average have blue-collar jobs and there are more blue-collar workers among men. This could be one explanation for the greater difference in male and female life expectancy. Statistics Estonia calculates life expectancy separately for urban and rural population, population of counties, by nationality and, as of 2017, by education, as a new indicator. Life expectancy is greater in urban areas, among people of Estonian nationality and people with higher education. The difference between male and female life expectancy is also decreasing in these groups. Life expectancy of males and females with higher education differs by 7.7 years, while in the case of basic education, the difference is 10.1 years. The difference in the life expectancy between females with higher education and males with basic education is 17 years. Life expectancy at birth is the average number of years that a new-born is expected to live if mortality indicators specific to the time period do not change. According to Statistics Estonia, in 2017, cinema attendance set a new record, surpassing 3.5 million visits for the first time. Cinema attendance has doubled in the last ten years. The rising popularity of cinemas can be explained by an increase in the number of cinemas and a wider selection of films as well as by the generally higher living standard. In the last year, 355 films were distributed in Estonian cinemas, of which 28 were produced in Estonia. For the second year running, more than half of the films distributed were imported from European countries. At the same time, the proportion of films produced in the United States continues to decrease, and for the first time in this century, films produced in the United States accounted for less than one third of the films distributed in Estonian cinemas. Although more and more films distributed in cinemas are produced in Europe, films produced in the United States are still the most popular. The animation “Despicable Me 3” was the most viewed film of the year, with a total attendance of nearly 149,000. Over a half of cinema-goers saw films produced in the United States, while the attendance of European films accounted for less than a quarter of all cinema visits. As many European films are screened during special festivals, they are typically screened for a shorter period and attract less viewers than Hollywood blockbusters. The most popular Estonian film was “Sangarid”, with an attendance of over 85,000. In total, Estonian films were seen in cinemas 282,000 times and grossed more than 1.5 million euros. The box office of Estonian films accounted for 8% of the total box office in Estonia (19.4 million euros). 22 full-length films were produced in Estonia in 2017, including 11 feature films and 11 documentaries. 30 short feature films, 70 short documentaries and 7 short animations were also produced during the year. Although animations remain popular in Estonian cinemas, no animations have been produced in Estonia in the last five years. Full-length film – a film of a duration of at least 60 minutes. Short film – a film of a duration of less than 60 minutes. For the statistical activity “Film”, the main representative of public interest is the Ministry of Culture, commissioned by whom Statistics Estonia collects and analyses the data necessary for conducting the statistical activity. Museums continue to be popular in Estonia. According to Statistics Estonia, in 2017, for the first time, there were more than 3.5 million museum visits. In 2017, there were 242 museums, including branches, in Estonia. Excluding branches, there were 186 museums. In 2017, there were for the first time slightly over 3.5 million museum visits in Estonia. Compared to 2016, there were 50,000 more visits. As expected, the greatest number of visits took place in Harju county (1.7 million), followed by Tartu county with 900,000 visits and Lääne-Viru county with 230,000 visits. Visits by foreign tourists accounted for 35% of all museum visits. The share of foreign tourists was biggest in Harju and Saare counties and smallest in Rapla and Järva counties. In 2017, there were 2,659 museum visits per 1,000 inhabitants in Estonia. According to the European Group of Museum Statistics (EGMUS), this is one of the highest scores in Europe. Excluding branches, 39% of museums were Estonian private museums, 35% belonged to local governments, 32% were owned by the state and 2% were foreign private museums. Taking branches also into account, one third belonged to the state, one third to local governments and one third were private museums. While private museums were mostly operating in one location, state museums stood out with many branches: 39 state museums had 69 locations. For the statistical activity “Museum”, the main representative of public interest is the Ministry of Culture, commissioned by whom Statistics Estonia analyses the data necessary for conducting this statistical activity. The classification of museums is based on UNESCO classification. According to Statistics Estonia, the preliminary estimate of the population of Estonia as at 1 January 2018 was 1,318,700, which is 3,070 persons more than at the same time a year ago. The population decreased by 1,960 due to negative natural increase (the number of deaths exceeded the number of births) and increased by 5,030 due to positive net migration (more persons immigrated to Estonia than emigrated). In total, the population of Estonia increased by 0.2% in 2017. 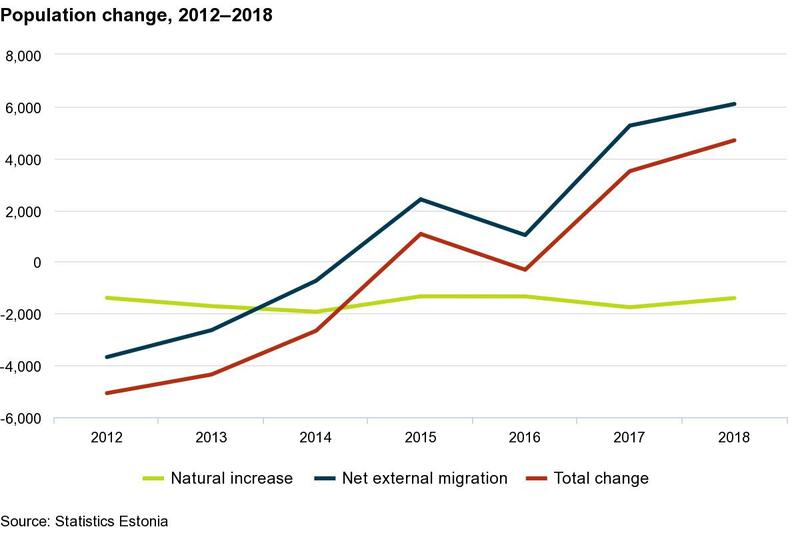 Net migration has been positive in Estonia for three years in a row. More than 13,520 children were born in Estonia in 2017. The number of births decreased by nearly 400 compared to a year ago. Considering that the number of women in childbearing age is decreasing, it shows that the number of births per woman has not decreased considerably. There were 15,480 deaths in 2017. The number of deaths has been relatively level in this decade, varying by +/-300. The share of older people increases in the population as life expectancy continues to increase. 10,470 persons immigrated to Estonia and 5,440 persons emigrated from Estonia in 2017. Migration statistics are most difficult to estimate based on preliminary data, as Statistics Estonia supplements migration figures with data from other registers, and later adds also unregistered migration according to the methodology of calculating population based on residency index. Reaching the final result is more complicated compared to other events, both technically and methodologically, and can significantly increase migration flows. Emigration increases mainly due to unregistered leaving of Estonian citizens. Immigration increases mainly due to their return migration, which is not recorded in the population register, as the prior leaving was not registered. Compared to immigration, emigration is less registered, and therefore, emigration increases presumably more than immigration in the revised population number – it can be assumed that net migration is somewhat smaller in the results published in May. The preliminary population published by Statistics Estonia is based on changes of residence in the population register in 2017 – persons whose residence was not Estonia at the previous year‑end but was so at this year-end are considered immigrants, and persons whose residence was Estonia at the previous year-end but not at this year-end are considered emigrants. The initial population number is based on initial data on births, deaths and migration. A thorough review of the residency index is HERE. Statistics Estonia will publish the revised population number with revised demographic events (migration, births and deaths) on 9 May. According to Statistics Estonia, the most popular film in Estonian cinemas in 2016 was the Estonian comedy “Class Reunion”. In the cinema attendance rankings since the restoration of independence, “Class Reunion” came second after James Cameron’s “Avatar”. In the attendance rankings since the restoration of independence, “Class Reunion” had approximately 189,100 viewers, only 5,000 viewers short of the record set by James Cameron’s “Avatar”. Thus, it became the most viewed Estonian movie since the restoration of independence. “Class Reunion” also became the first film to gross over a million euros in the Estonian market – no Hollywood movie has reached this milestone. Despite the success of “Class Reunion”, only 21 Estonian films were screened last year – the number was three times higher in 2015. In Estonian cinemas, 199 films from other European countries and 138 films from the United States were screened. In total, cinemagoers could choose from 377 films in 2016. Besides “Class Reunion”, “Ice Age: Collision Course” (approx. 133,200 viewers) and “The Secret Life of Pets” (approx. 121,600 viewers) also made it into the top three of viewer rankings. In 2016, there was also a record number of cinema visits – a total of nearly 3.3 million visits were made to Estonian cinemas, which is 200,000 more than the year before. Although more than a third of the films screened in 2016 were produced in the USA, US films still had nearly twice as many viewers as films from other countries in total. While the average ticket price for Estonian and other European films was 5.1 euros, cinemagoers had to pay on average 40 cents more to see an American movie. In 2016, a total of 27 full-length films were produced in Estonia – 13 feature films and 14 documentaries. There were also 19 short feature films, 74 short documentaries and 21 short animations produced. No full-length animations have been produced in Estonia in the last four years. Full-length film – a movie with a duration of at least 60 minutes or a video of at least 52 minutes. Short film – a movie with a duration of up to 59 minutes or a film for television with a duration of up to 51 minutes.